I have had this old dining room set for almost 30 years. It was one of the first pieces of furniture my husband and I bought when we first married. I've kept it for years and since we are in a home transition, it is now our go to eating table. But ya know.....it just doesn't fit and hasn't fit....with where we are today. So why not paint it? Right? Paint can pretty much transform anything and you don't have to be afraid of it. I sort of had a plan (haha sometimes I change as I go). I love the coco color from Annie Sloan. It's probably the closest color with brown tones in it and reminds me of hot chocolate. I gave my table a little "scuff" with sandpaper only because my finish was so slick and shiny. A little scuff will allow the paint to adhere better. Don't worry about complete coverage your first time through. Just make sure you go from left to right and make a complete swipe from end to end on your last paint stroke. This will help minimize your brush strokes in the middle of the table. Then let the paint self level. Let it dry. 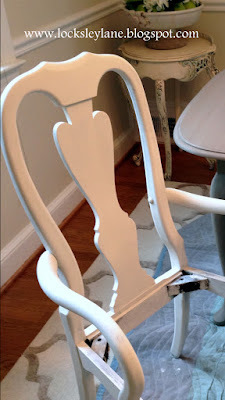 Then I painted the chairs a mixture of half pure white and half old white. It's a pretty white without too much ivory. But when I put the chairs next to the table, they were too.....plain for me. I like a little "sprinkles" with my neutrals (you know a little extra something). So I did a coco wash and put this on the chairs over the white. It brought the chairs to life and gave them a warm feel to match the coco table. I also thought the table was a little plain, so I added an outline with gold gilding wax. This is such an easy thing to do and it added just the right little bit of umph! As much as I love Annie Sloan paint, I am not a fan of the wax on large surfaces. That's ok... You don't have to wax. You can put a water based polycrylic over this and it will be beautiful! That's what I did. I got a clean smooth finish on a table that will see lots of grease and food and the finish makes me happy. That's what's important. YOU have to like it. If you don't like a wax finish, you have options. ;) I did wax the chairs as I like a waxed chair finish. Just not large surfaces. It's so pretty and works so much better in our little space that I can't believe I waited so long to do this. Next, I will be covering the chair pads.... stay tuned. Don't be afraid to tackle what you think is a big job. This was so much easier than you might think.